The new Coldplay album, 'Viva La Vida Or Death & All His Friends' is not due for release until 17th June, however since 6pm on 6th June Coldplay have been streaming their new album through MySpace at www.myspace.com/coldplay . This is the latest part of Coldplay’s pre-release digital strategy for the new Viva La Vida album. After promoting free concerts virally and allowing users to download ‘Violet Hill’ and ‘Viva La Vida’ in advance of the album release, Coldplay have now started streaming their new album on MySpace 11 days before release. This may seem like a strange thing for Coldplay to do, but 510,000 copies of the new album 'Viva La Vida Or Death & All His Friends' have already been sold on itunes pre-order and the MySpace move has been rumoured to have been prompted by the new album leaking on a torrent on 4th June. 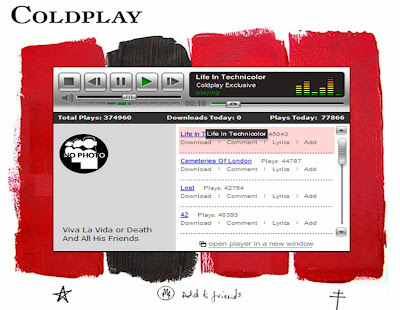 If ‘Viva La Vida Or Death & All His Friends’ is already available on the internet then Coldplay have nothing to lose by showcasing the new tracks to fans in an official Coldplay environment (the Coldplay MySpace pages), rather than letting fans experience it through unendorsed sources. The free Violet Hill free single was an extraordinary success, downloaded over 2 million times in a week through Coldplay’s website – four times more 'sales' than the entire UK top 40 put together. The MySpace preview continues the trend of allowing Coldplay fans to freely access new Coldplay music and the rewards for the band will not just be from record sales, but also from areas like touring, merchandising and commercial deals. This seems to be the direction that record companies are having to head in and Coldplay are definitely leading the way!